Prominent & Leading Exporter from Ambala, we offer double surface phototherapy unit, hospital suction machine, surgical suction machine, portable suction machine and infant warmer. 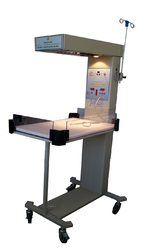 Our Phototherapy Unit (Double Surface) is effective in treating neonatal jaundice. As the equipment is provided with a gearbox, its height can be adjusted easily. Easy to use controls and long functional life have made our equipment a sough after product in the market. It requires less maintenance and is far-famed for its sturdy construction. 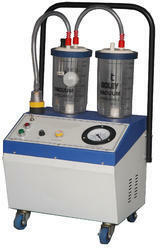 Suction machine fitted with oil immersed noiseless motorized vacuum pump. cabinet made from mild steel powder coated, s. S. Top. 2 graduated glass jars of 1. 6 ltrs. Fitted with synthetic rubber lids & overflow safety device. 2 mtrs. 10 mm pressure tubing. mounted on 4 rubber costars. Robust and simple to maintain, our range of Surgical Suction Machine is in line with the defined industry standards. Compact design and easy to use controls have earned these machines enormous appreciation. These have non-collapsible tubing and self-lubricating mechanism for hassle-free functioning. 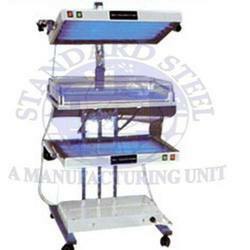 With our excellence in this domain, we offer these machines in varied specifications. Max Vacuum 710 ± 10mm Hg regulable through Vacuum Control Knob. Power Source AC 220V 50 Hz. Single Phase. Heavy Duty motorized pump for fast vacuum built – up. Finely regulable 0-710mm ± 10 Hg vacuum – Easy to read – off. Over Flow Safety Device: over – flow check valve and removable filter to protect the pump from moisture. Self lubricating system for trouble free service. Power Source AC 220V 50 Hz. Single Phase. Current: 2.5+ 0.5 Amps. We provide our clients with precisely engineered Portable Suction Machines with powder coated body and stainless steel top. The machines do not create any noise and are appreciated by clients for self-lubricating system. These robust and durable machines are simple to maintain and consume less power. Available in various specifications, the machines are used in a number of health care units. Heavy duty motorized pump for fast vacuum built up. We are offering a wide range of Infant Warmer. Ceramic Radiant heater is provided to prevent humidity loss. Mounted an easy rollon castors.